Today at VidCon Facebook pre -announced three new big product updates for Facebook Live, their live-streaming platform built into Facebook. 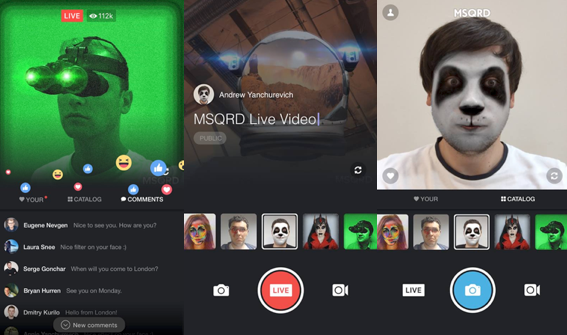 The platform will soon let you do two-person remote broadcasts, pre-schedule your streams and create a virtual waiting room for viewers and broadcast with MSQRD’s face masks. Essentially, you can invite a friend to “drop in” on your broadcast and join the conversation. Mark Zuckerberg hinted at this during his Live Q&A last week, noting that it would be cool if he could have different guests and celebrities participate remotely in his Live videos. Lastly, and on a more fun note, Facebook is adding the ability for users of the MSQRD app to go live on Facebook directly from the app. MSQRD is the video filter app (similar to Snapchat’s lenses product) that Facebook acquired in March. Once the update launches, users will be able to try on different masks and effects from within MSQRD, all while the footage is being broadcasted live to your friends. Broadcasting live to your friends can take a lot of guts, especially if you don’t have any interesting content to show them. Letting users broadcast live from MSQRD will arm them with funny content that should encourage them to go live more often.